Darts superstar Rob Cross has moved up to second in the Unibet Premier League after night 11 of the 16-week roadshow event. The St Leonards-based world champion won one and lost one of his two matches at Rotterdam Ahoy last night (Wednesday) to boost his chances of qualifying for the end-of-competition play-offs. Cross firstly recorded a 7-4 win over World Grand Prix winner Daryl Gurney with a performance containing four 180s and two ton-plus outshots. The world number three raced into a 5-0 lead, aided by checkouts of 107 and 119 in the third and fourth legs respectively. After Cross missed the bullseye for a 126 finish, Gurney hit double 12 to get on the scoreboard and then narrowed his deficit to 5-2 with a 120 outshot. Cross landed his third 180 on his way to breaking throw for 6-2, but then missed two darts at double 16 for the match and Gurney broke back for 6-3. Gurney landed a 138 checkout to make it 6-4 only for Cross to begin leg 11 with his fourth 180 en route to a victory-clinching 15-darter. Later in the evening Cross was beaten 7-3 by two-time world champion Gary Anderson, who missed double 12 for a perfect nine-darter in the eighth leg. Both players landed three 180s, but Anderson hit three ton-plus checkouts to Cross’s one and didn’t miss a single dart at a double in the opening seven legs. Cross produced a superb 144 outshot to hold throw in the opening leg before finishing 84 in two darts to go 2-1 up. But Anderson reeled off the next five legs helped by checkouts of 120, 104, 117 and 70 in two darts. Cross pinned 63 in two darts to stay alive at 6-3, but missed three darts at a double in the next leg - for the second time in the match - and Anderson finished 56 in two darts to close out his win. Night 12 of the Sky Sports-televised competition will take place at the same venue tonight (Thursday) when Cross will be up against Peter Wright. 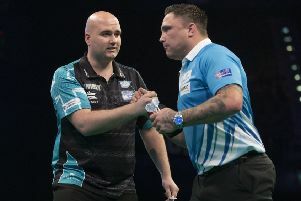 Unibet Premier League standings (played-points): 1st Michael van Gerwen 11-18 (+36), 2nd Rob Cross 12-16 (+10), 3rd Gary Anderson 12-15 (+15), 4th Michael Smith 11-14 (+18), 5th Daryl Gurney 11-11 (-1), 6th Simon Whitlock 11-10 (-5), 7th Raymond van Barneveld 12-10 (-14), 10th Peter Wright 12-10 (-17).